Film Score Monthly presents one of the most important series of film score recordings of all time: Elmer Bernstein's Film Music Collection. From 1974 to 1979 legendary composer Elmer Bernstein financed his own series of classic film score LPs which he distributed through a mail order club. Though a few of the albums were reissued on LP—and one on CD—the entire series has long been out-of-print and a "Holy Grail" for film music aficionados. This 12-disc boxed set is the definitive CD presentation of the Film Music Collection. The series features classic scores by Max Steiner, Franz Waxman, Miklos Rozsa, Bernard Herrmann (including the unused Torn Curtain score), Alfred Newman, Alex North, Dimitri Tiomkin, and Bernstein himself (including the sublime To Kill a Mockingbird). As a special bonus, the final disc in this box set features Bernstein's never-before-released 2003 Prague re-recording of his score for Kings of the Sun—a 1963 Mayan adventure starring Yul Brynner. The album was meant to be released on Bernstein's Amber Records label, but never came out. The FMC box set is packaged as follows: the 12 discs come in three "butterfly" or "clamshell" cases—the kind which used to be commonplace for 2CD sets—with each case holding four discs. The three "butterfly" cases go into a larger, hard-cardboard box along with a 136-page hardcover book containing all of the original LP liner notes as well as new material: an overview by Jon Burlingame, an essay by Jay Alan Quantrill (one of the original liner note authors), reissue producer's note by Lukas Kendall, and new commentary for Kings of the Sun including a remembrance by Prague orchestra contractor James Fitzpatrick. The book is chock-full of written musical examples as well as archival photographs, many of which have never been seen. Elmer Bernstein's Film Music Collection is one of the most significant film music album series ever undertaken, with a major film composer conducting his own performances of his and others' works. While some of these scores have since been released from their original soundtracks, several others are lost and will never be released—or exist only in monaural sound, while the entire FMC is in stereo. In the 1970s, these LPs were lights in the darkness for film music fans, and the recordings became treasured entries in film music collections. The historical albums are finally preserved on CD in this loving collection. For contractual reasons, there are currently no plans to release these albums separately, and some of them may never be otherwise available. The box set is limited to 2,000 copies—first-come, first-served. The box set that you hold in your hands has long been a Holy Grail for soundtrack collectors. Elmer Bernstein was asked by many people over the years to release or license his Film Music Collection on CD and he always declined. Those of us in the "soundtrack-producing community" assumed that he intended to issue the albums himself, but it never happened. In producing this box set we encountered what were likely the issues that held up Elmer's own plans for the Collection. Fortunately, three of these "lost" albums were reissued by Warner Bros. Records in 1978 during a shortlived deal to broaden the FMC's distribution. Warner Special Products graciously allowed us to use their 1/4" stereo masters for The Thief of Bagdad (BSK 3183), To Kill a Mockingbird (BSK 3184) and Torn Curtain (BSK 3185). In reviewing the contract for these three LPs, we discovered that this was not a term license—Elmer sold the albums' distribution rights in perpetuity. (Viva Zapata!/Death of a Salesman was to have been the fourth FMC title reissued by Warner Bros., but this never transpired.) Fortunately Elmer retained for himself one key right: that of distribution by mail order, which we are using for this box set. Otherwise the three FMCs handled by Warner Bros. are the domain of that company forever, and further distribution of the Collection is that much more complicated. There are five albums for which masters no longer exist: Wuthering Heights, Viva Zapata!/Death of a Salesman, Madame Bovary, Land of the Pharaohs/Gunfight at the O.K. Corral and The High and the Mighty/Search for Paradise. The only choice has been to master the CDs from the vinyl. Fortunately, Elmer had many sealed copies of each LP still in storage, and John Davis at Precision AudioSonics has carefully broken the precious seals to make the best possible transfer of each side. Combined with the denoising in Sonic Solutions by Doug Schwartz at Mulholland Music, this is the best resolution to an imperfect situation. When it became clear that mastering from vinyl was unavoidable for five of the albums, we decided to "sweeten" this box set with a treasure from Elmer's glory days that he had re-recorded at the end of his career: Kings of the Sun, which he had intended to release on his own Amber Records label. James Fitzpatrick, the orchestral contractor for the City of Prague Philharmonic Orchestra, kindly volunteered his time to assemble the final disc in this box set from the edit-plan Elmer made of the sessions. While not literally an FMC recording, it is both the spiritual descendent of the series and the coda to Elmer's remarkable professional life. All of us who love film music have been grateful to Elmer for his diverse and wonderful scores. Unlike any other film composer, Elmer went far beyond being grateful to the profession for which he was so ideally suited. He opened his heart and his pocketbook, and he dedicated himself to the livelihood and well-being of the art form. He cherished film music, as we cherish him. Thank you, Elmer. Don't forget to accent your new film music collection with this special publication from FMS! 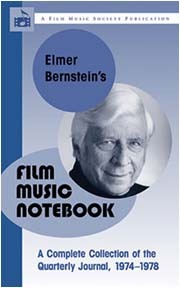 Click on Elmer Bernstein's Film Music Notebook for more information from the Film Music Society on this special release. 3/15/11 This is on sale for one week! 25% off: $149.95. This is a big deal for us...we weren't sure we would ever mark this down...it was a huge production, our first box set, only one of two we did with a hardcover book. I don't have an exact count on the remaining quantity in stock but I think it's around 300-330 out of the only 2000 produced. When they are gone, they will be gone! It's one of my favorite sets in my collection, people should buy this, especially at this price you're offering! This set is such a wonder. Thanks again for releasing it and surmounting so many hurdles! This was worth every penny of the cost... and at sale price, it's a bargain! Apart from the superb recordings, the packaging is stupendous. A real labor of love, first by Elmer Bernstein, then by FSM. This set is fantastic, and was well worth the full price. Take advantage of the discount, folks! It's hard to believe that this release used to clog the board with the rampant speculation, now it's discounted. I'm envious of those of you who can purchase Mutiny on the Bounty and Raintree County at these new, insanely-generous prices---$12.95 for Raintree County? $24.95 for Mutiny on the Bounty??? The latter is a three-disc set! Try 'em, kids--they're an amazing couple of scores. i hope these are as great as the praise. very unfamiliar with most of these but i've placed the order. looking forward to making some discoveries! Performed by the Royal Philharmonic Orchestra and the Saltarello Choir; Bruce Ogston, Baritone; Phyllis Cannan, Mezzo-Soprano; and Powell Jones as "Abu"